In episode 58, Rosie and Jessica report back on meals out, have been watching short French musicals and delve into their favourite genre of television, the light-hearted Australian murder show. They rattle through their Top 5 80s Movies and the whole episode descends into an unplanned sing-song. 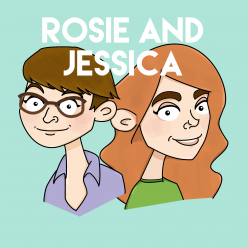 Jessica picked 1000 Ships by Rachel Platten (as heard on A Playful Day) and Rosie picked Allo Darlin’ and their Josie Long-titled Let’s Go Swimming. Rosie talks about Miss Piggy’s cardigan from The Muppets Take Manhattan in Episode 16. Catch up with Miss Fisher‘s Murder Mysteries, now on Netflix. We assure you, she is called the Empress of Blandings. The Redneck Vegan makes bossauges. Armadillos, moths and more in these balloon sculptures. This episode was edited by Intern Rigby.